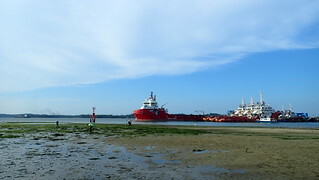 wild shores of singapore: Pasir Ris shores are alive! Pasir Ris shores are alive! 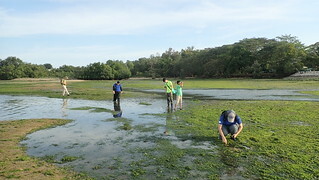 Together with great company, I explored Pasir Ris shores and mangroves on a gorgeous evening. 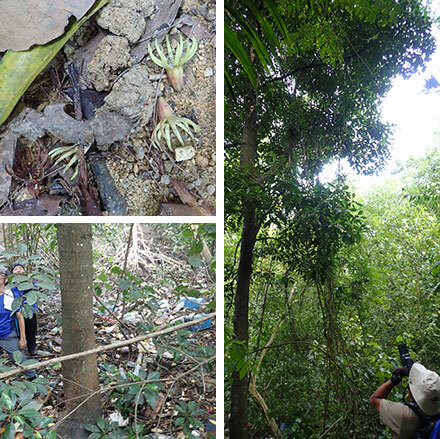 One of the world's rarest mangrove trees grows here, and it's still alive. 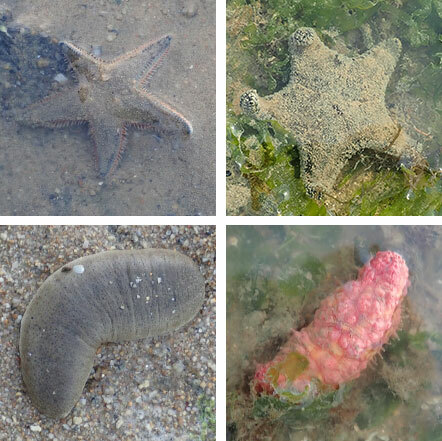 The shore was teeming with sea hares, slugs, even a nudibranch. As well as sea stars, sea cucumbers and more! It's good to see this, because this shore was hit by the 300-tonne oil spill in the East Johor Strait in Jan 2017. 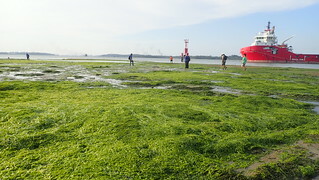 A bloom of fresh green Sea lettuce seaweed covered some parts of the shore. This is normal and happens seasonally, usually towards the end of the year. Seaweed is food for many different kinds of animals. 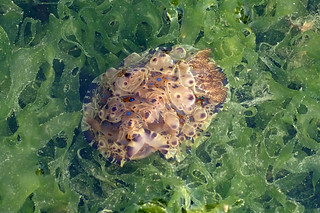 There was a seasonal 'bloom' of sea hares which eat algae and seaweed: we saw two kinds - Spotted sea hares and Hairy sea hares, and many egg strings laid by them. There were also many Leaf slugs. Vincent found this nudibranch! 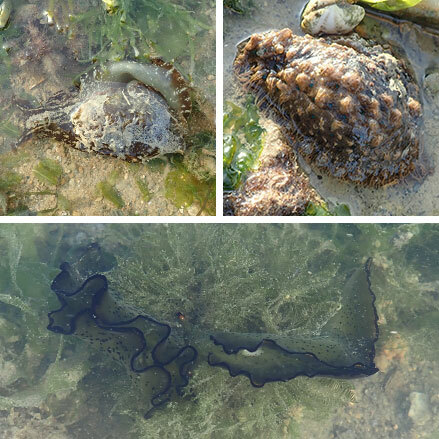 Indeed, we often find nudibranchs at Pasir Ris shore. I also saw a small Cake star, many Plain sand stars and many Garlic bread sea cucumbers and Pink warty sea cucumbers. The rest of the team also saw Thorny sea cucumbers. The seagrasses are still lush here. All Spoon seagrass with large leaf blades. This shore was hit by the 300-tonne oil spill in the East Johor Strait in Jan 2017. 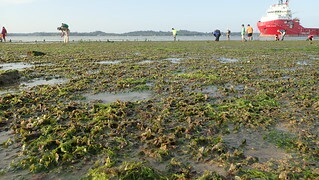 When I checked up on it a week after the spill, the seagrasses were bleaching. But the seagrasses were lush and green in Jan 2018, and again today. There was a sand bar teeming with fiddler crabs. Vincent managed a great close up of them. The shores also had lots of straw tubeworms, Bazillion snails. There were also Fan shell clams, Window panes shells. Hermit crabs and lots of crabs. All signs of good health. 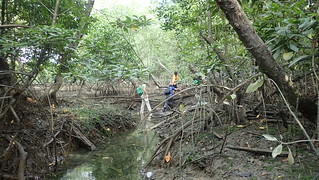 We started our trip with a quick look at a tiny mangrove here. A bit challenging to figure out a safe way across while minimising trampling. The tiny patch of mangroves seem quite healthy. With nice soft soft smelly mud and meandering streams. This is the home of the beautiful Bakau mata buaya, listed as 'Critically Endangered' not just in Singapore but globally too! We last visited the tree in Jan 2018. It is now the last large Bakau mata buaya on the mainland (the one at Sungei Buloh is dead). This tiny patch mangroves are still being used by fishermen to store their kayaks and there is still a build of litter here. We saw lots of calyx strewn under the tree, and one propagule. There were also blooming flowers in the tree. Thanks to Zaki Jalil for this photo of them! 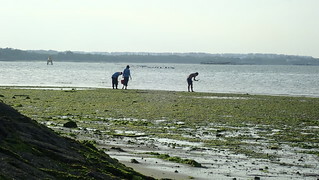 There were many people out on the shore carrying plastic bags, apparently collecting Gong gong snails. There were a few cast-netting in the waters. 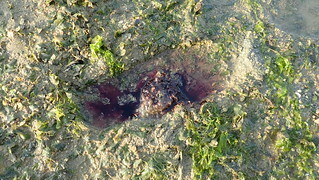 Trampling does impact some marine life, like this Hairy sea hare that secretes a purple ink when it is alarmed. As usual, there is still much litter on the shore. Many are clearly from fish farms, e.g., fish feed bags, bags of ice, and small packets of carbo like noodles (expired carbo is used by farms to make into fish food). There are 60 Singapore fish farms located off Pasir Ris Park. They are not provided with daily door-to-door trash collection and are expected to bring their industrial trash back to the mainland. 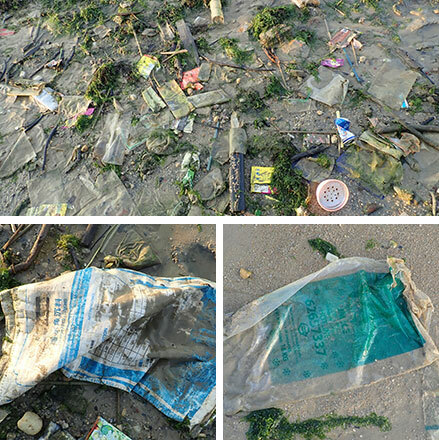 Here's more about trashy Pasir Ris Park and fish farms. Those large vessels that we always see docked in this area, I found out belongs to Oil Spill Response, a global NGO that is activated to clean up oil spills. This is one of their regional bases, where they are on standby with equipment and supplies to deal with oil spills. Here's how they tackle oil spills, from a talk I attended in Mar 2014 ago by Oil Spill Response. I had a lovely day with great company exploring this shore. I hope it stays safe until our next survey there. Also by Victor Toh and Jimmy Ng. Others on this trip: Chay Hoon, Jeremy.